Here at the 1802 House, we are always striving to create a breakfast menu that’s a little different from what our guests would prepare for themselves at home. I love gruyere cheese in anything and am always looking for new ways to use it in our recipes. 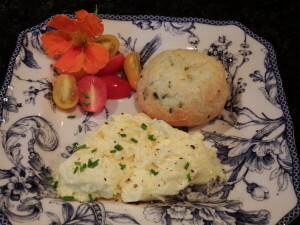 In these cheesy puffs, we’ve combined Gruyere with chives to make beautiful Gougeres to serve with eggs. They have a real WOW factor with guests, but this savory ‘pate a choux’ is so simple to make. These Gougeres freeze beautifully. I always try to keep some on hand for those days when I’m only cooking breakfast for a small number of guests. They are so easy to take out of the freezer, bake and serve with a sour cream scrambled egg and sautéed Portobello’s. It takes a simple breakfast to a whole new level. The gougeres also pair well with a nice wine in the evening as Hors D’Oeuvres. Just use a smaller scoope to make them and adjust the baking time. Prepare all of your ingredients so that they are ready to use as you need to work quickly once you start making the gougeres. Put the water and diced butter into a medium sized saucepan. Over medium-high heat, melt the butter, swirling the pan a couple of times until the butter is completely melted. When the butter is melted, turn the heat up to high and bring to a rolling boil. Turn the heat off and immediately dump the flour into the hot water. Working quickly, with a wooden spoon, stir together until the flour is incorporated and the dough forms a ball and leaves the side of the pan clean. Place the pan aside for 5 minutes to cool. Beat in one egg at a time with a wooden spoon. The mixture will be slick and slimy as you add each egg and you will need to stir it quite well to incorporate. Don't add the next egg until each one is thoroughly combined. When the eggs are beaten in, add the cheese, chives and mustard and mix all together well. Your dough should be sticky and thick. Use an ice cream scoop to form the gougeres. Take a full scoop and place on a baking sheet lined with parchment paper. You should get 10 - 12 gougeres depending on your scoop size. Preheat oven to 375 F. Bake 25 minutes until light golden brown. Serve immediately. If you want to freeze your gougeres for later use, put the baking sheet with your uncooked gougeres in the freezer and leave for several hours until thoroughly frozen. Remove from the baking sheet and store in a freezer bag. When ready to use, remove from freezer. Put your gougeres on a baking sheet lined with parchment and let sit at room temperature for 30 minutes to thaw. Preheat oven to 375. Bake for 25 minutes. They will rise and turn a light golden brown when done.